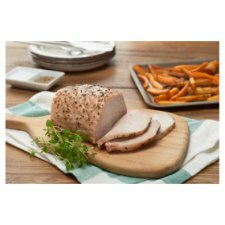 Rindless, boneless pork loin joint with added water, seasoned with salt and pepper. From trusted farms Working with selected farmers that we trust, to ensure high welfare standards and consistent quality. Perfect for a hassle free family meal, just place in the oven and follow the simple cooking instructions. 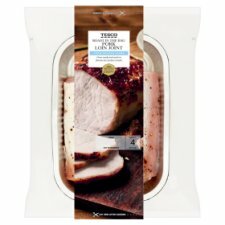 INGREDIENTS: Pork Loin (91%), Water, Maize Starch, Dried Glucose Syrup, Salt, Sea Salt, Acidity Regulator (Sodium Carbonate), Black Pepper, Tapioca Starch, Malt Vinegar Powder (Barley), Stabiliser (Xanthan Gum). Contains gluten and pork.For allergens, including cereals containing gluten, see ingredients in bold. Keep refrigerated. Once opened, use immediately and by "use by" date shown. Instructions: Pre-heat oven, place in a roasting tin and place on the middle shelf. Cook for 60 minutes. Avoid the bag coming into contact with open flame or heating elements. Once cooked remove bag from the oven and allow to rest for 15 minutes before opening the bag and carving. When opening the bag, carefully cut down the front with scissors. Take care when opening the bag as steam will escape.